What began in the 19th century as an agricultural implement manufacturer has grown into a 21st century equipment powerhouse. Mustang was known in the early years as the Owatonna Mfg. Co. and was among the first to make what is known today as the skid steer loader. Since that time, Mustang has combined years of experience with new innovative processes to offer one of the broadest lines of compact equipment available today. This includes the compact excavator line, which got its start in 1999. Mustang compact excavators are reliable, strong and maneuverable, making them the perfect partner on the most challenging jobsites. The two newest Mustang excavators are the minimal tail M units. The 80M is a highly compact machine ideal for rental and the 10-ton 1000M for dealer rental fleets, utility contractors and heavy construction. The 80M offers compact dimensions to travel along sidewalks, drive through doors as well as backyard gates and features an operating weight of only 2,348 lbs for easy transportation. The 1000M is the largest in the Mustang lineup offering 14 ft, 10 in. of digging depth and a heavy-duty operating capacity of more than 20,000 lbs. These M units provide robust boom, minimal tail swing designs that will go 60 degrees in either direction, allowing for more consistent digging without the need to reposition the machine. 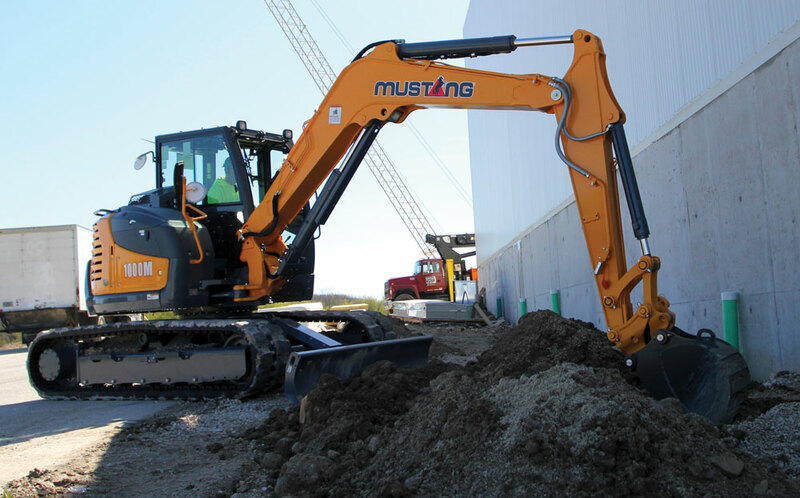 The Mustang zero tail swing excavators consist of six models: the 170Z NXT2, 250Z, 350Z NXT2, 450Z NXT2, 550Z and 800Z NXT2. The machines are designed around a reliable Yanmar engine that delivers enhanced engine performance and efficiency. The Mustang Z excavators are true zero tail swing machines with no cab overhang beyond the tracks in any direction. This allows the machine to operate directly against a wall or other obstruction without causing damage to the structure or machine. The Mustang 1000M, 250Z, 350Z NXT2, 450Z NXT2, 550Z and 800Z NXT2 excavators are equipped with a hydraulic quick-coupler, making attachment changes as simple as flipping a switch. The hydraulic systems on the Mustang zero tail swing excavators incorporate two variable pumps and two gear pumps. The pump oil flows are combined and redirected where needed, allowing for simultaneous operation without loss of hydraulic power. An operator can save fuel when full performance is not necessary by reducing engine rpm by 10 percent using the ECO Mode on the 1000M, 350Z NXT2, 450Z NXT2, 550Z and 800Z NXT2. The mode is easily activated and deactivated with a simple toggle switch. An angle blade with a float and bolt-on cutting edge is a factory installed option on the 350Z NXT2, 450Z NXT2 and 550Z. Using the rocker switch on the blade lever, the hydraulic angle blade can be angled up to 25 degrees to push material aside as the machine moves forward. In addition to the above features, the 170Z NXT2 and 1000M are equipped with a unique variable undercarriage, which extends from 3 ft, 1 in. wide to 4 ft, 2 in. wide. This allows the machine to access narrow, hard-to-reach areas and also gives it the ability to increase stability on uneven terrain. With a variety of attachments available, Mustang compact excavators transform to meet the needs of landscape, utility, construction and rental applications. Learn more about Mustang here.